As one of the best-kept secrets of hotels in downtown Houston, we provide spacious yet competitively priced rooms perfect for budget-savvy travelers that appreciate the big city but also enjoy quiet and comfortable accommodations for nightly or extended stays. We make traveling easy for those here on business, exploring the city or attending an event at the nearby George R. Brown Convention Center, Toyota Center or Minute Maid Park. Complimentary features of our Houston hotel include: on-site parking, weekday downtown shuttle service, a full breakfast, Wi-Fi, fitness facility and business center. Each suite includes a refrigerator/microwave, USB outlets, a Keurig , pillow top mattresses and 150+ HD channels on a 42-inch TV. Nestled between Midtown and Washington Ave. there is plenty of nightlife for young professionals and some of the top restaurants in the country one would expect to indulge in while staying at a Houston, Texas hotel. The nearby Refinery Bar and Grill offers an escape for guests after a hard days work and we kick off the end of a workday with happy hour from 5-7p.m. Mon-Thurs featuring complimentary selected beers and wines along with hors d'oeuvres. Many of our guests often enjoy a run along the Buffalo Bayou or purchase a day pass to The Downtown Club, which offers a spa, cardiovascular/strength training and indoor tennis/basketball courts. In addition, our backyard extends to Eleanor Tinsley Park and Sam Houston Park for the outdoorsy types. Often catering to families, we boast close proximity to The Downtown Aquarium featuring marine life, a Ferris wheel and carnival games; while others enjoy the Museum and Theater Districts or light rail before returning to relax in our beautiful pool and spa with the downtown Houston skyline as a backdrop that no other hotel in Houston, Texas can compare to. 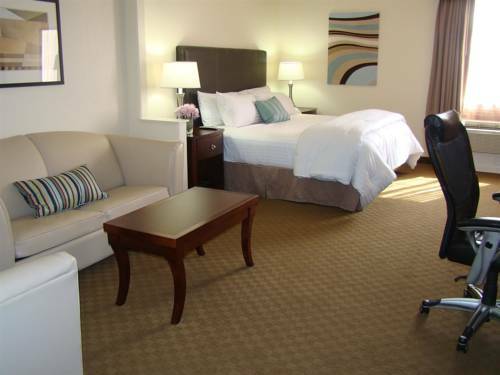 We welcome you to book a suite at the Best Western Plus Downtown Inn & Suites today! Enjoy your stay. From: 45 North. Take Interstate 45 South, exit at Dallas and make a right on Dallas. The Best Western Plus Downtown Inn & Suites is two blocks on your left. From: Intercontinental Airport. Take Interstate 45 South, exit at Dallas and make a right on Dallas. The Best Western Plus Downtown Inn & Suites is two blocks on your left. From: Hobby Airport. Take Interstate 45 North, exit at Scott Downtown, take Pease Street to West Dallas, and make a left turn on West Dallas. The Best Western Plus Downtown Inn & Suites is two blocks on your left. 0.50 mile(s) from Luther's Bar-b-que, 11:00 a.m. to 3:00 p.m. and 5:00 p.m. to 9:00 p.m.
0.50 mile(s) from Massa's Restaurant, Seafood, 11:00 a.m. to 3:00 p.m. and 5:00 p.m. to 9:00 p.m.